Hawaii is known for its floral splendor and wide variety of plant life. No where can this be better seen than on the island of Maui. With its tropical rainforests, cool Upcountry slopes, and sunny western shores Maui is a botanical paradise. Driving down any road, you'll see multi colored bougainvilleas and hibiscus in almost everyone's garden. On Maui tropical exotics from all over the world mingle freely with the 24 Polynesian plants that have sustained ancient Hawaiian culture such as mai'a (banana) and coconut (niu), kalo (taro), kukui (candlenut), 'uala (sweet potato), and wauke (paper mulberry). These plants are commonly known as the "canoe plants." At the same time, the steep mountains of Maui, Moloka'i, and Lana'i contain protected pockets of native plants both endemic and indigenous, many of which are endangered. Close to 1,000 species of these plants occur nowhere else on Earth and about 100 (10%) of these species are indigenous to Hawaii. Unfortunately, however, there are also over 900 species (or 44% of the plants) of naturalized plants, many of which are detrimental to native plants by replacing them or crowding them out. Such is the delicate balance of the Hawaiian ecology. Maui is also home to a wonderful assortment of botanical gardens, most of which are open for either guided or self-guided tours. In this feature we'll take a look at some of these beautiful gardens. Two well established botanical gardens in the Upcountry district of Kula give a vivid introduction to the kind of plants you won't find growing on the mainland of the United States. Kula Botanical Garden covers six acres in a multi level, hillside terrain. 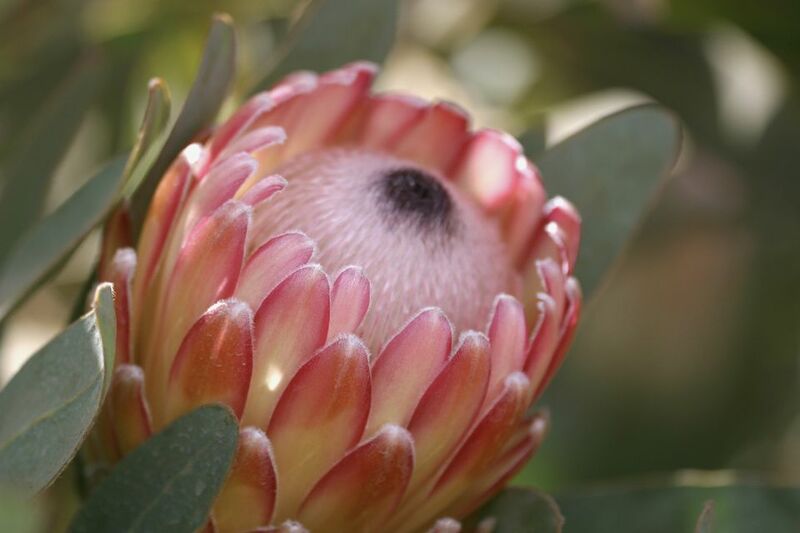 Easy paths let people experience 2,000 types of indigenous plants as well as an excellent display of proteas, one of the leading plants in Maui's floriculture industry. The diverse landscape includes a stream and a large koi pond. The gardens are open daily. Just a few miles away, the 8-acre Enchanting Floral Gardens lives up to its name by blanketing eight acres in more than 1,500 exotic tropical and semi-tropical species, including orchids, hibiscus, and jade vines. The gardens are open daily from 9:00 a.m. to 5:00 p.m. There is a small admission fee per person. Both of these gardens make good side trips on the drive to the summit of Haleakala. Maui's legendary Hana Highway is literally a tropical wonderland lined with roadside flower stands and floral gardens for visitors to enjoy. The Garden of Eden Arboretum & Botanical Garden is a beautifully landscaped 27-acre property dedicated to restoring natural ecosystems and promoting Hawaii's native and indigenous species. Featuring many exotic plants and trees from the South Pacific region and tropical rainforests of the world, this garden includes an unusually extensive collection of ki or ti plants. The Garden of Eden Arboretum & Botanical Garden is open daily from 8:00 a.m. to 3:00 p.m. Admission is $15.00 per adult and $5 per child. Wear good walking shoes and rain gear; carry insect repellent, sunscreen, and extra water for the self-guided tour of the six-acre Ke'anae Arboretum, located about halfway to Hana. The first half mile of the trail passes through introduced plants such as ornamental ginger, papaya, and hibiscus. At the end of this section is a taro patch (lo'i kalo) filled with lots of Hawaiian varieties of this essential food source. The next one-mile section of the trail leads through a Hawaiian rain forest. There is no admission charge. Two of Maui's largest botanical gardens are dedicated to the cause of preserving the plants essential to native Hawaiian culture. At these gardens the cause of conserving native and Polynesian plant species is inseparable from the greater cause of conserving native culture and traditional lifestyle. These sites are leaders in the general effort to malama, or care for, Maui's cultural and natural riches. On the next page will look at the first of these two gardens. Kahanu Garden in Hana serves as the guardian for an important archaeological site, the enormous, centuries old stone temple known as Pi'ilanihale Heiau. A 500-acre natural sanctuary with vast, well trimmed lawns, this National Tropical Botanical Garden preserves an entire stretch of gorgeous coastal land. Two distinct garden areas deserve separate mention. One is its small forest of breadfruit trees. Kahanu Garden maintains the world's largest collection of this important food crop of the Pacific. Because it contains 130 distinct varieties gathered from 20 tropical island groups, this collection serves as a "germplasm repository" for a culturally important plant whose variety reflects untold generations of human history. Distinct from this collection is the Canoe Garden, an assemblage of all the useful plants that the early Polynesian settlers brought to Hawaii and depended on for the prosperity of Maui Nui's native culture. As with the breadfruit collection, the intent here is to preserve the genetic diversity of these plants - 40 different types of ko, or sugar cane, for example, and many unusual types of mai'a, or banana. Other culturally important plants gathered from the surrounding countryside and preserved here include 'uala (sweet potato) kalo (taro), ulena (turmeric), and wauke (paper mulberry, used to make kapa cloth). Self-guided tours are available Monday through Friday from 10:00 a.m. until 2:00 p.m. The tour is 1/2 mile long and takes about 1 1/2 hours. There is a $10.00 per person fee and reservations are not required. Children 12 yrs. and under free. Very different in atmosphere but similar in mission is Maui Nui Botanical Gardens, located right in the center of Maui's busiest town, Kahului. Focused strictly on Hawaiian plants, this garden makes no distinction between the conservation of plant species and the conservation of native culture. Lisa Schattenburg-Raymond, director of the garden, says, "Our mission is to help people understand the living Hawaiian islands of today. By bringing together the plants of Maui Nui - our immediate environment of Maui, Moloka'i, Lana'i, and Kaho'olawe - we serve as a center for environmental education and as a place where Hawaiian cultural expression can flourish." A nonprofit project supported by community memberships and grants, the garden works in partnership with local conservation groups such as the Hawaii Rare Plant Recovery Group and the Maui Invasive Species Committee. Its projects include hosting workshops in the use of native fibers and dyes, providing sales of Hawaiian plants to the local gardeners, and donating native plants to a variety of wilderness restoration projects. The garden is open from 8:00 a.m. to 4:00 p.m. on Monday through Saturday. It is closed on Sundays and major holidays. Admission is $5, but free of Saturdays. Docent led tours are available for $10 per person. All donations are gladly appreciated. At Maui Tropical Plantation, near Wailuku, is a 60-acre working plantation where visitors are introduced to Maui's commercial crops, including papaya, pineapple, guava, mango, macadamia nuts, coffee, avocado, bananas, sugar cane, star fruit and more. There are tram rides, evening barbecues, a nursery and a gift shop of products. While clearly designed for the tourist, the 40 minute tram tour is a fun experience in that you get some close up views of many of the types of flowers, plants, and fruit trees found in Hawaii. The tram runs daily, starting at 10 a.m., and there's a fee to ride. Adults $20.00 each plus tax, Children ages 3-12 $10.00 each plus tax. The prices for many items in the gift shop are actually quite reasonable. If you're looking for Mauna Kea macadamia nut products they have some good prices here. Clearly, Maui's botanical gardens are about something much more than botany. They are places where the life of the land can flourish despite the pressures brought by growth and progress.